I know we're getting a bit top heavy in the Program Launchers category. But in case you haven't found what you're looking for, here's one more choice. Maybe. 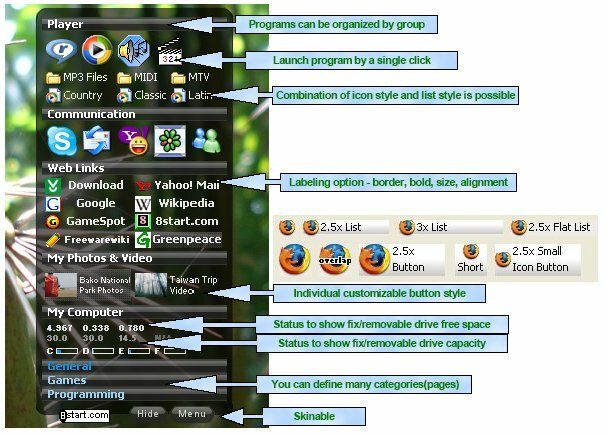 8start Launcher can be portable. Use the install, copy then uninstall method. Many options for how you want this thing configured. One thing to keep in mind is that it doesn't look like you can use relative paths for USB portable apps. One other thing I should mention is that the developer seems very responsive. He quickly replied to an email inquiry I sent. No relative paths, but does it at least cope with changing drive letters? Andrew Lee wrote: No relative paths, but does it at least cope with changing drive letters? No. An enhancement request was sent to the author. IMO, this software is currently not portable due to the drive letter issue.